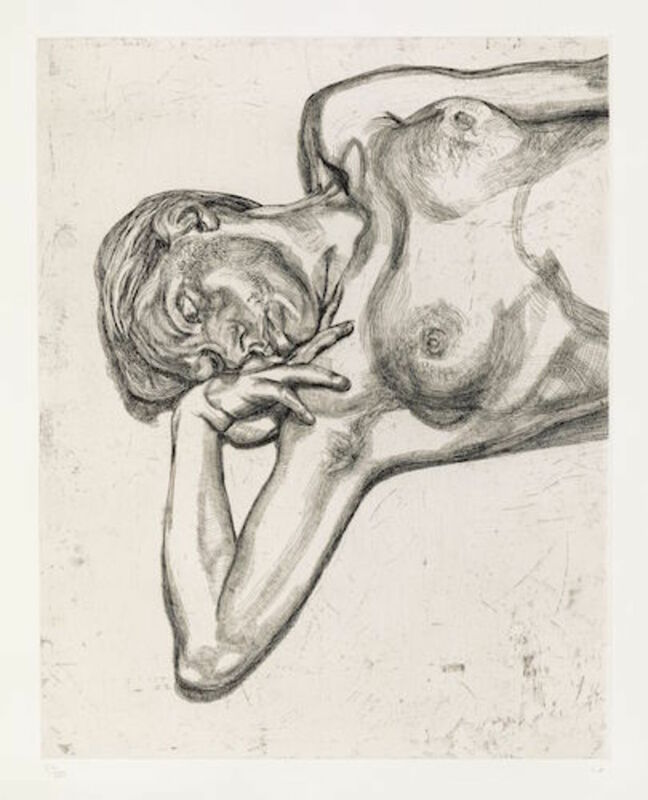 Lucian Freud, Head and Shoulders of a Girl, 1990, etching on paper, 31 x 25". Throughout his long career, the painter Lucian Freud rarely experimented with other media. Among the chosen few was printmaking, but even that was limited to etchings. The current exhibition is devoted to this side of Freud, presenting fifty-one prints, plus three paintings, produced over a span of twenty-seven years. Even in this seemingly incompatible medium—his etchings, after all, are composed wholly of lines, whereas oil painting allows one to work with viscous areas of color—the figurative essence of Freud’s style is conveyed. Some of the prints are quite demented—A Couple, 1982, depicts a middle-aged pair with their faces stuck together in smiles so wide they verge on the wicked. Little details, such as the curly scribbles conveying the texture on the woman’s blouse, serve as the identifying features of the painterly hand animating these linear compositions. Head and Shoulders, 1982, is maybe the clearest example of the artist’s playful way with line and patterns. Of course there’s no reason to focus solely on these formal elements. The vast majority flock to Freud for his rawness of humanity, of which there is plenty in the compulsory section dedicated to nudes, where we find renderings of many of the artist’s favored models, such as Sue Tilley. Then there are the profound character studies, including A Conversation, 1998, depicting a daughter elevating a half-smoked cigarette above her shoulder while her mother grips a cup of tea, leaning over as if she were digesting the words that have just pierced the smoke. Keyed in to all the nuances of life, Freud could bring it out of whatever he puts his hands to.